Do you enjoy exploring the world by car? Me too. I recently took a six-hour road trip from Los Angeles to California’s central coast. The drive was breathtaking, but about three hours in I started to become fidgety and uncomfortable. As a yoga instructor, that’s particularly unsettling, as I’m used to feeling comfortable with my body. But I also know how to quickly get comfortable again and I’m sharing that knowledge with you! 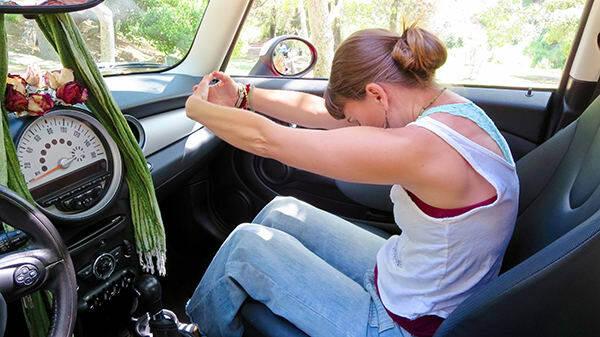 If you’re going a little stir crazy in the car or just starting to feel stiff on your road trip, pull over and do these 10 yoga poses. In 10 minutes or less, these yoga poses can give your muscles, tendons, ligaments, and joints the attention they need to help you feel less stiff. And that makes life behind the wheel a whole lot more pleasant. The lower back is the loudest barker when you’re dog tired behind the wheel. Start by facing in your seat with your feet flat on the floor and hip distance apart. Twist your upper body so that you are looking out the back window, gripping your seat with both hands to assist in holding the pose and deepen the stretch. Take 8-10 breaths. Repeat in the other direction. When you sit too long in one position your hips and inner thighs can get sore. This pose can help ease the ache. It will be slightly more difficult if you have a small car or are blessed with long legs. Place the outside of your right foot on top of your left thigh, close to your groin. Most of you will stay there and take 8-10 breathes to stretch out one leg at a time, then repeat on the other side. This is called half Lotus. However, if you are experienced in this pose and want to try full Lotus, carefully bring your left foot up and over your shin, placing it on your right thigh. Allow the backs of your hands to rest gently on your knees, thighs, or on your lap. Straighten your back and hold this pose for as long as you comfortably can (at least 8-10 breaths). Switch leg positions if possible, and repeat. Warning: Move into this posture very slowly to avoid injury to the knees. If you have knee problems, you may want to skip this one. This pose is especially good for opening the inner groin, thighs, and hips. It also works wonders for sciatica sufferers. Start by facing forward in your seat with your feet flat on the floor and spread slightly wider than hip distance apart. Keeping your left foot flexed, pick it up and rest your left ankle on your right thigh. You can stay here if you feel a deep enough stretch, or you can thread your left hand between your legs and grab onto the back of your right thigh to go a bit deeper. Hold onto your left hand with your right hand to pull both legs toward your chest (you can place your right foot on the seat if you like). Hold for 8-10 breaths. Switch sides, and repeat. People often hold tension in their necks and shoulders, and even thinking about driving is enough to make it worse. To loosen up, simply roll your head from side-to-side several times. Start by sitting tall in your seat and tucking your chin toward your chest as you roll your shoulders back and down. Now roll your head to your right, moving your right ear toward your right shoulder. To intensify the stretch, place your right fingertips above your left ear and your left fingertips on your left shoulder, and pull very gently in opposite directions. Hold for 8-10 breaths. Repeat on your other side. Is your lower back still aching after performing the previous stretches? Try this one next. Place both feet flat on the floor so that they’re hip-width apart. If you have room, reach for the floor with your hands, keeping your back flat as you hinge forward. Drop your head at the end to stretch your neck. If you can’t fold all the way down, rest your arms and head on the dash. In addition to opening up your low back and neck, you should feel a stretch in your hamstrings. Hold for 8-10 breaths (or even longer if you like). Now it’s time to kick back. This pose will restore blood flow to your pelvic cavity and the lower back, and release swelling in your legs and feet caused by sitting for extended periods. You may need to push your seat back (and recline it a bit) for this stretch, especially if you have long legs. Place your feet on the dash with only a very slight bend in your knees, and lean back. That’s all there is to it. Hold for at least 8-10 breaths, or for as long as you like. You can transition into this pose right after you do “legs up on the dashboard” to stretch your hamstrings, inner thighs, hips, and spine. All you have to do is keep your right leg extended with your right foot on the dash, and pull your left leg in, resting your left foot on your right thigh. Keep your spine straight, and then fold over your right leg. Hold for 8-10 breaths, and then switch sides. 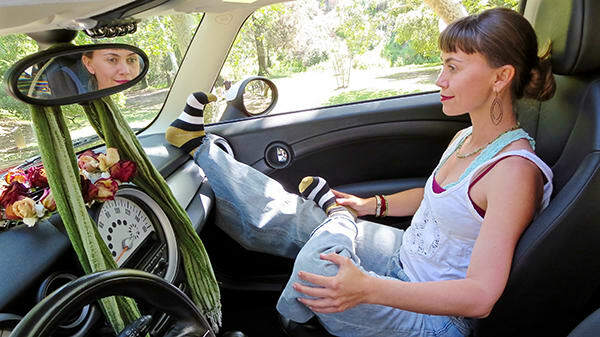 Odds are you sit in your car in much the same way you sit at your desk — hunched over. The result: Tight shoulders. Begin by sitting up straight with both feet flat on the floor. Lean forward slightly and grab the seat behind you, extending your arms as you continue to lean forward. In addition to your shoulders, you should feel a stretch in your chest. Hold for 8-10 breaths. This stretch, which targets the posterior region of your shoulders, is a perfect one to do after the anterior shoulder stretch. Sit tall with both feet flat on the floor. Reach your arms straight out in front of your shoulders and interlace your fingers with your palms facing inward (you should feel a stretch in the tops of your wrists). Arch your back to create a C-shape with your torso, rounding your shoulder blades, and then drop your head to stretch the back of your neck. Hold for 8-10 breaths. This stretch also targets your shoulders and arms, especially your triceps. Sit up straight in your seat with your feet flat on the floor. Raise your right elbow and drop your right hand behind you. Now reach your left hand behind you, reaching up to grip your right hand. If that’s too difficult (or uncomfortable), reach your left hand up to grip your right elbow, pressing down gently. Hold for 8-10 breaths. Switch sides, and repeat. For more helpful yoga poses, check out Beachbody On Demand Yoga Studio or purchase DVDs of 3 Week Yoga Retreat!